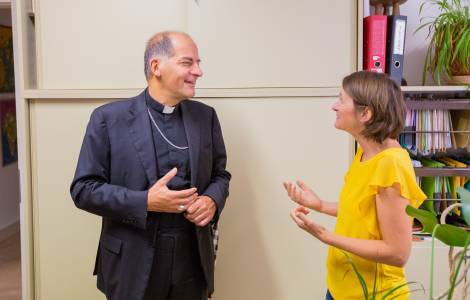 Aachen (Agenzia Fides) - Archbishop Giovanni Pietro Dal Toso, President of the Pontifical Mission Societies (PMS) is in Aachen, Germany, for a two-day visit at the National Directorate of Missio and of Missionary Childhood. Mgr. Dal Toso, who will be welcomed by the National Director of the PMS in Germany-Aachen, Mgr. Klaus Kramer, and will meet the trustees of Missio in the morning and, in the afternoon, the heads of the various sections: foreign and Missiology Missio Institute, will visit the Mikado library, the formation sections, donations, communication, theological foundations. In the evening there will be a meeting with the management of Kindermissionswerk, the Sternsiger and Missio.